Heat oven to 350°F. Spray 6 jumbo-size muffin cups with cooking spray. 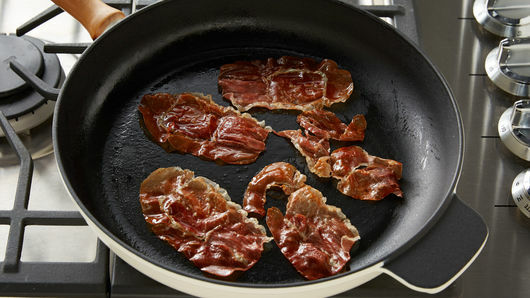 In 12-inch nonstick skillet, cook prosciutto over medium heat 6 to 8 minutes, turning occasionally, or until crisp. Finely chop; set aside. In 2-quart saucepan, melt 1 tablespoon of the butter over medium heat. Add shallots; cook 2 to 3 minutes, stirring constantly, until tender. Place in small bowl. In same saucepan, melt remaining 1 tablespoon butter. 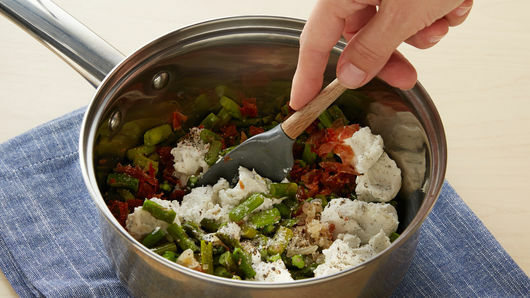 Add asparagus; cook 2 to 3 minutes, stirring occasionally, until crisp-tender. Remove from heat; add shallots, prosciutto, 4 oz of the goat cheese, the salt and pepper. Mix well. Unroll dough onto work surface. Cut dough into 6 squares. Press dough squares in bottom and up sides of muffin cups; fold edges to be even with top edges of cups. Crumble remaining 1 oz goat cheese over dough in cups. Spoon 1/4 cup prosciutto mixture evenly into each cup. Break 1 egg at a time into custard cup; carefully slide egg over filling in each cup. Bake 25 to 30 minutes or until egg yolks are set. Gently lift out of muffin cups with metal spatula. To serve, sprinkle each with chives. 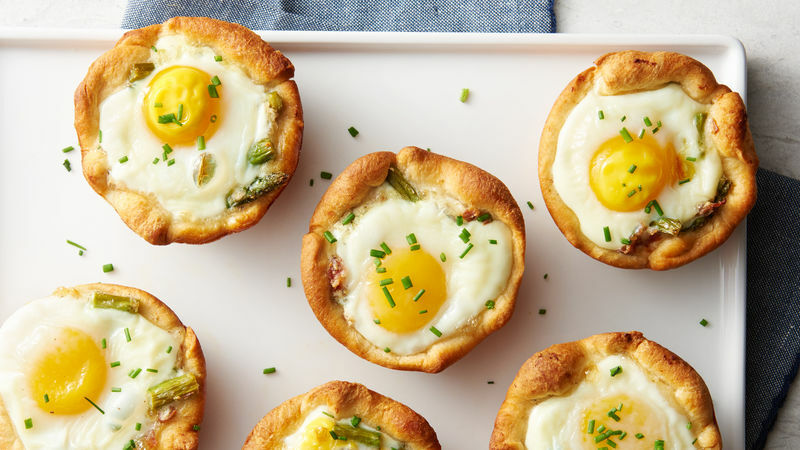 Don’t have a jumbo muffin pan? Use 6 oz. custard cups and place on a cookie sheet to bake. You may also know goat cheese by its French name, chèvre. I am the fourth of six children. When I was a child, my mom baked and cooked for us all week long while my dad traveled most weeks, leaving us on Sunday night and returning home on Friday night. As a break for my mom, my dad would get up early on Saturday and Sunday mornings and make us delicious breakfasts that we all still talk about today. They included eggs Benedict, cheese soufflé and, one of my favorites, asparagus omelets. I can still remember being told "breakfast is the most important meal of the day." Today, all my siblings are good cooks and many of these breakfasts are made when we visit each other. When I was seven or eight, I got an Easy Bake Oven® for Christmas. My siblings crowded around the oven waiting in anticipation to eat each one of the pies and cakes that came out—that's when I saw for myself how rewarding it was to make food for others. A few years ago, my husband and I left the hustle and bustle of suburban Atlanta and retired to a small farm in rural Georgia. We enjoy growing most of our own fruit and vegetables and raising Nigerian dwarf goats. They are very good milkers and easy to handle. My chèvre cheese and goat milk yogurt is a highlight and enjoyed by family and friends when they come to visit. We also have chickens providing us fresh eggs and honeybees giving us sweet honey as well as pollinating our garden. 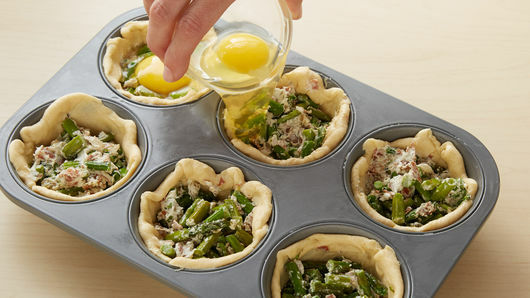 My cozy weekend breakfast entrée, Creamy Chèvre and Asparagus Breakfast Cups, is something I think my dad would like and be proud of. I can't wait to bake it this year’s Thanksgiving weekend when all my siblings come to visit us. It will surely become a favorite with my family and friends.